Taking Qigong (also known as chi kung) classes over the Internet is a great way to learn this ancient art form of physical conditioning. You can find quite a few websites that offer various Qigong classes online. In addition to the lessons, many of the websites offer free tips for how you can gain the most from your Qigong practices. If you're looking for one Qigong exercise that will reward you with the most benefit, according to Bruce Frantzis of Energy Arts, the Dragon and Tiger Qigong Online Course is it. The cost is three monthly payments of almost $40 each. Frantzis learned this Qigong set from Zhang Jia Hua, a Chinese medicine doctor during his 10 years in China. Hua taught over 20,000 instructors who in turn taught the Dragon and Tiger Qigong set to over 20 million Chinese students. According to Frantzis, the 1,500-year-old Dragon and Tiger Qigong Set is a self-healing movement system that gives 80% of the same benefits of longer, more complex forms. This medical Qigong set activates the acupuncture meridian lines and clears out energy blockages and cleanses your entire body. The exercise is easy for anyone at any age to learn. Be sure to check out the many free two-minutes or less videos offered on the website. Student testimonials from long-time practitioners of Qigong and novices are positive and often grateful. These include comments such as "unparalleled in the complete method of teaching" and "very new and interesting parts of a familiar practice". A seven-year Tai Chi instructor said, "... great course and it has allowed me to deepen my practice." Founder of The Chi Center, internationally recognized teacher and healer Qigong Master Mingtong Gu was trained by several Grandmasters in China. He also trained at the world's largest Qigong hospital ("medicine-less") Zhineng Qigong Center. Treating over 200,000 patients (over 185 different illnesses), the hospital claims a 95% effective improvement rate. Practice portal: Each month video and audio practice sessions accessible through computer, smartphone, or tablet. Access to group online practice weekly: The entire class practices live with other students around the world through Master Gu's recordings. You can find testimonials throughout the website from students of all walks of life that include instructors, psychologists, psychotherapists, Chinese medicine doctors and various medical professionals around the world. One student commented, "I cannot think of a time I have gained more valuable learning from a course." Another student wrote, "Lesson 7 was profound and very deep for me - even life changing." Stories of individual healings are posted for readers. A unique take online learning experience, Discover the Fire is a monthly subscription based portal for learning Qigong. There are currently 11 courses available to subscribers that are taught by different instructors. The courses are described as being "high quality audio, video, and written documentation for the very best learning experience." Each course has its own page that features a brief overview of what the Qigong set accomplishes, such as strengthening body organs. Course descriptions vary with what's included; there is no description of how many videos or the length of the course. A bio of the instructor also follows the description. There three memberships available and each has a set of benefits. The benefits for the yearly or month-to-month options are the same, with the only difference being the price, while the private student will receive different benefits. "The exercises seem perfectly selected both for beginners and slightly more experienced practitioners," said one member. One member with a physical problem commented, "...all kinds of trouble with my back and other issues and I'm happy to say that I can feel the strength returning and the pain is gone. I cannot thank you enough for bringing this practice into my life." Members also comment on how they enjoy being a member and that the videos are "really a big help and are almost like taking a live class." Quite a different type of online learning takes true advantage of all modern technology at the White Tiger Qigong Online Distance Learning. The White Tiger School is at The Seeds of Life Qigong Studio in Ubud, Bali, Indonesia. The online video features Master Tevia Feng demonstrating several Qigong sets. By using an online direct communication, such as Skype or Vsee, students have instant communication with the Qigong Master. Students also have the option of submitting videos of their practice and then arrange a Skype call with their Qigong instructor to go over corrections that are needed. All levels of Qigong students are accepted. A live group online training session is held every Tuesday at 8 a.m. U.S. Eastern Standard time (8 p.m. in China). A new Qigong course is taught each month. The cost is $25 per session. This online individual instruction consists of an hour online instruction and requires the student to upload a video of his/her practice via a private YouTube account. The school says that "Master Feng watches the videos and e-mails personalized feedback to each student." During the next class, Master Feng goes over the video with the student, offering his feedback so that the student understands and knows how to make necessary corrections. The cost is $100/hour online instruction and $25 for video submissions and feedback. Many of the testimonials are videos that are insightful since the person's enthusiasm comes across better than written testimonials do sometimes. Students said, "I have been to China to train Qigong and Kungfu, but Tevia's training was so much more detailed and thorough explanations that I never got before." Another student said, "The man is a gold mine of knowledge and experience in the Martial Arts." And all seemed to agree with how one student summed up the training, "Tevia is one of the best teachers I met." Long White Cloud Qigong: Six free online courses are offered, including a comprehensive free 12-week online class titled Qigong Walking. A PDF file, meridian chart, and practice log are typically included. London School of Tao Arts: This school offers a comprehensive online course that includes 80+ instructional videos downloads, 60-page PDF Introduction to Tai Chi Circling Hands, weekly practice logs, guided sinking Qi + dissolving practices (MP3s), and private forum access. The cost for the course is three payments of almost $40. Chikung Unlimited: If you're looking for quite a bit of free information and detailed instructions, this is a resource that provides you with these. There are free lessons offered, but you must submit your email to receive the lesson via email. You can also earn other free e-courses by sharing your story on the website once you've completed the coursework. There's no guarantee your story will be selected for publication, but if it is, then you can earn a free course. The courses are reasonably priced. Qigong Chinese Health: This Australia-based company offers general health classes and specific health issue classes. The online classes are sold in one-hour increments. Some classes only require three hours of online classes while other may require as many as eight, one-hour classes. There's no information on exactly how the online classes are conducted. Cost ranges from $24 -$32 with one for $160 -$200 per hour. Sounds True with Lee Holden: Lee Holden is well-known for his instructional DVDs and offers an online course through Sounds True website. This is a self-guided video course consisting of 11 video downloads, 12 audio downloads, and one set of written course materials. The cost is $137. A self-directed process is in keeping with the overall philosophy of feng shui and Qigong therapies. You must take responsibility for self before you can advance to any level of spiritual awakening. Qigong conditions your body to accept that guidance through the flow of qi energy. Overall, the online classes are very instructive and easy to follow. You can learn various techniques and with the aid of videos, you get the benefit of an experienced instructor demonstrating the correct way to perform each exercise. There is a wide discrepancy in the cost of Qigong lesson that can range from 10 dollars to thousands of dollars. Because there is such a chasm in the price points, you want to do some research before shelling out any money. Typically, online classes are cheaper than in-person classes for the obvious reasons that online classes don't require one-on-one instruction or the overhead costs of running a brick and mortar facility. One of the best benefits of online classes is that many offer free lessons in addition to the paid ones. This gives you the opportunity to test rive the product before purchasing. You can evaluate the instructor and how you respond to his style of teaching. 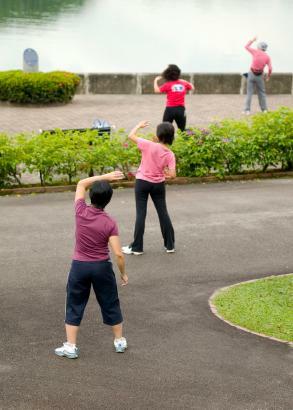 You also gain a free introduction to Qigong to assess if it's the type of exercise you enjoy. It might not seem as though Qigong and feng shui are connected, but they are very similar in philosophies and practices. Just like feng shui, Qigong is focused on the flow of chi (qi) energy. In feng shui, you want to free up the outside and inside space of your home or office so the chi energy can flow naturally through your environment. Qigong also directs the flow of chi energy through your body, so chi can deliver beneficial energy to your organs, blood, muscles, bones, and tissues. This life force energy governs all matter in the universe (Ten Thousand Things) so it is only logical that it can also govern your body. When this energy is balanced, just like feng shui applications, your body will function at optimum levels for good health and well-being.